Gikany and Una have waited somewhat impatiently for the final book in this Bloodbound trilogy. We were not disappointed. The Bloodsworn is our favorite book of the series. What makes this series so captivating is the characters. All three main characters (Alix, Liam, and Erik) developed over the course of the three novels. Gikany and Una enjoyed discussing the changes that Alix, Liam and Erik each underwent as the series progressed. We watched them grow in both confidence and decisiveness. The heartache they felt after making tough choices grounded the novel. Not only do the characters have depth, but their individual journeys also help connect the reader to the story. A theme that runs through the entire series is the necessity of choosing to be a good man or a good king. Sometimes the choice a king faces means deciding between doing what his conscience dictates and what is best for his kingdom. At first glance it seems they would be the same thing, but this series explores how it is not always so. It was fascinating to watch as Alix and Liam not only supported Erik as he faced these decisions, but as they faced them as well. We enjoyed the multifaceted mythologies, politics, and cultures of Alden and the surrounding kingdoms. It was gripping to watch as Alix navigated another kingdom and its culture as she tried to save her king and kingdom. The suspense of her adventure behind enemy lines was nail biting. 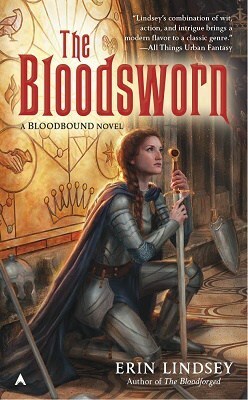 The Bloodsworn is an engrossing and captivating final novel. We were on the edge of our seats while our heroes fought against formidable odds to save Erik and the kingdom. Their loyalty and courage were awe-inspiring. If you enjoy suspenseful fantasy with politics and war, you should read the Bloodbound series. We look forward to more from this author. As the war between Alden and Oridia draws to its conclusion, the fates of both kingdoms rest on the actions of a select group of individuals—and, of course, the unbreakable bonds of blood..
Q: Which came first with this series? A particular character or the plot? Or did they double team you? EL: Definitely the characters. Although there’s a lot of adventure in the series, at their heart these are really character-driven books. I wanted to focus on people and relationships, and how those things are shaped by the big events going on around them. I was particularly interested in what makes a hero, what makes a good leader, and the sorts of tough choices that entails – politically, strategically, and above all personally. Q: What is the appeal of writing a series vs. a standalone? EL: The biggest appeal for me in writing a series is getting to spend more time with the characters. By the second and third book, you really know these people well – how they’ll react in certain situations – and things become much more organic, almost autonomous at times. You lose a bit of control over your characters at that point, which is exciting and also really challenging; you need certain things to happen from a plot point of view, but sometimes your characters have other ideas. Standalones are great too. They really challenge you to have a clean, focused idea of what you’re trying to achieve. In some ways that’s harder than doing a series, because although you don’t need to plan several books into the future, you also don’t have the luxury of indulging in some of the side paths you might get to explore in a longer work. So you need to be crystal clear on the story you’re trying to tell and have the discipline not to deviate from that, which is a lot harder than it sounds. Q: What’s next in store? Are you working on any new projects? I’m working on a new project that I’m soooo excited about! It’s a mystery set in Gilded Age New York, and it’s chock full of humour, paranormal shenanigans, and romance. It’s tons of fun, and I can’t wait to unleash it on the world! Erin’s publisher is giving away one (1) copy of The Bloodbound, the first book in her Bloodbound Trilogy. To enter, please fill out the Rafflecopter form AND leave a comment at the end of this post sharing what new release you are most looking forward to reading before the end of 2016. The giveaway is open during the time specified on the Rafflecopter form. Winner(s) chosen at random from all eligible entries. This contest is open to U.S. and Canada mailing only, where not prohibited by law. Open to participants, 18 years or older, who are legally allowed to participate in such a contest as allowed by their local laws. All federal, state, local, and municipal laws and regulations apply. Void where prohibited. No purchase necessary. By participating in the contest, participants agree to be bound by the decisions of the contest sponsor. Prize will be delivered by the publisher. This blog, its reviewers, and the owner are not responsible for items lost in the mail. By entering this giveaway, participants agree to abide by these terms. congrats to Ms. Lindsay on the series! Sounds fabulous 🙂 I’m most looking forward to Cast in Flight by Michelle Sagara. Thanks for sharing! I’ve yet to read Magic Binds but I’m eager to. I’m also excited for Archangels Heart. I’ve had this one on my TBR and can’t wait to read it. I agree, I’m looking forward to both. Hope you enjoy Bloodsworn! This series has stunning cover art! I’m really eager to read A Million Worlds with You by Claudia Gray before year’s end. All the covers are beautiful. THANKS ALL… The contest is over, and the winner is Erin F.